Estonian conductor Paul Mägi has had a long and successful career as conductor and artistic leader of several prominent ensembles in the Baltic states, including the Latvian National Symphony Orchestra, the Estonian Radio Chamber Orchestra and the Estonian National Opera. In 2004 Paul Mägi became the chief conductor of Uppsala Chamber Orchestra, a result of several highly successful engagements in Sweden during later years. In Sweden he has been invited to the Swedish Radio Symphony Orchestra, the Stockholm Royal Philharmonic Orchestra, the symphony orchestras in Malmö, Gothenburg, Helsingborg and Norrköping as well as the Nordic Chamber Orchestra, the Norrbotten Chamber Orchestra and the Dala Sinfonietta. He has also conducted leading orchestras in USA, Russia, Finland, Ukrainia, Norway, Denmark, Italy, France, Belgium, Holland, Portugal, Bulgaria, Poland, Germany, Spain, Switzerland, Ireland etc. Paul Mägi is much in demand as an opera conductor and has been the musical director of many international productions including L’Italiana in Algeria, Il Trovatore, Die Fledermaus, Sour Angelica/Gianni Schicchi, Rigoletto, Dargomizhsky’s Rusalka at Wexford Festival in Ireland, Boris Godunov in Nantes Opera and Carmen with Moscow Helicon Opera on tour to Belgium, Cyprus, Salzburg and Féstival de Radio France in Montpellier, La Bohème and Swan Lake in Royal Swedish Opera. Among the many other operas Paul Mägi has conducted counts Le nozze di Figaro, Il flauto magico, Nabucco, La traviata, Don Carlos, Ernani, Il trovatore, Sour Angelica, Salome etc. 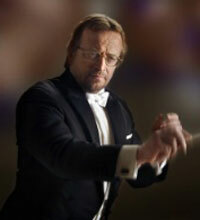 In 2011 Paul Mägi became the Music director and Chief conductor of Vanemuine Theatre, Estonia. Today, Paul Mägi counts among the leading pedagogues for future conductors and is the Visiting Professor of conducting at the Stockholm Royal College of Music as well as at the Estonian Academy of Music and Theatre. A prominent jazz violinist, Paul Mägi has played at the Debrecen Festival in Hungary, in Bulgaria, Cuba, Finland, Germany, Belgium, Scotland, Ireland, Great Britain, USA etc and featured as a jazz violinist with the London BBC and the Boston Symphony Orchestras.